You might think that we do everything around here but that simply isn’t true! There are some amazing community and volunteer groups in Somerville and here is just a sample of the incredible work they do to make Somerville the heart of Central Jersey! 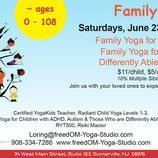 Join FreedOM Yoga Studio to experience yoga through the eyes of a child! Learn more and check schedule here!